LePage said Ryan was the one person on Capitol Hill that he wanted to meet with, but the speaker’s office never responded. Breitbart News visited the speaker’s office Friday before noon and requested a comment, and also left a phone message. A staffer at the speaker’s office told Breitbart News that a specific communications aide would respond by email, but no email arrived by the deadline. Republicans in Congress have been telling the American people for years that given the opportunity, they will repeal and replace Obamacare with a conservative, free-market alternative. The American people in turn have given the Republicans that opportunity. However, early signs do not look encouraging. It appears Congressional Republicans are still intent on catering to big-government lobbyists and politicians in states that took Obama’s welfare expansion bait. In the letter, the Maine governor told the speaker that he successfully vetoed five attempts to expand Medicaid in his state. 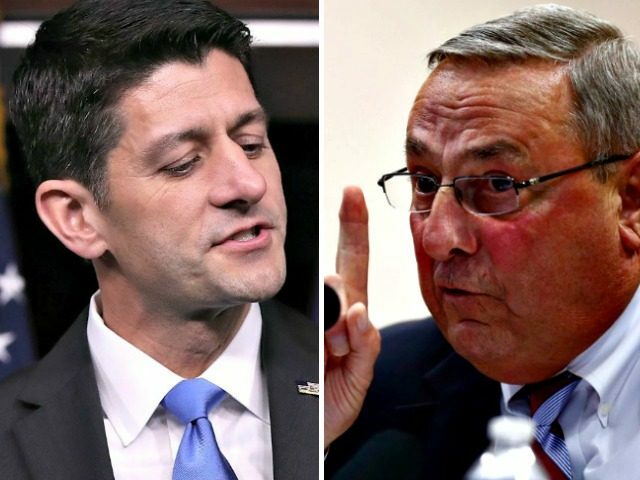 LePage said the trigger for his visit to Washington was Wisconsin Gov. Scott Walker‘s handling of Medicaid in the RyanCare bill. Walker is the president of the Republican Governors Association, and he has swung the RGA to back the RyanCare bill, including its own expansion of Medicaid, he said. The governor said his message to Health and Human Services Secretary Tom Price Friday, as well as anyone else he got in front of, was the need to freeze Medicaid expansion immediately and include a work requirement. On a more practical level, the governor said expanding Medicaid to able-bodied people has little or no effect on the number of uninsured, because the expansions pull people off of company plans.Medicaid pulls workers off their company’s plans, so the plan has a smaller population. The exodus leaves the remaining participants in the company plan with higher premiums and deductibles. LePage said his understanding of poverty is not a theory. “I was born in poverty, severe poverty. I ran away from home at 11. I was on the street for a couple of years before the state caught up to me. I was either going to go to Job Corps, or somebody was going to house me,” he said. The future governor grew up learning English as a second language and shining shoes to make his way. Two families took LePage in and he grew up surrounded by 17 siblings, he said. “Poverty is a state of mind,” he said. “If you help people, you work with them to get an education and work skills, they are indebted to you for life,” the governor said. In his 2014 reelection, LePage was down in the polls and given no chance to win, he said. When he did win with the most votes ever received by a Maine candidate, it was because the voters knew the governor was rolling up his sleeves and figuring out how to really help people, he said. “I lived the American Dream, so I feel I am qualified and I am capable to stand up and tell these congressmen they’re missing the boat,” he said. “Most lawmakers on Capitol Hill have never been poor, so they do not understand the dynamics of poverty,” LePage said. The governor said he loves to talk about the married man with four kids in his state who started working odd jobs out of his garage, while his paper mill was on strike. “He just sold his business for $30 million,” he said.